There is something amazing about a warm biscuit dripping with butter. 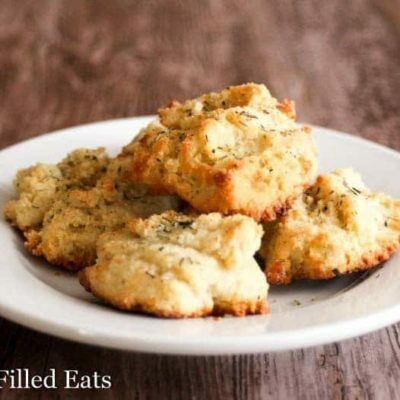 They are great as a side dish, with soup, salad, or just as a snack. 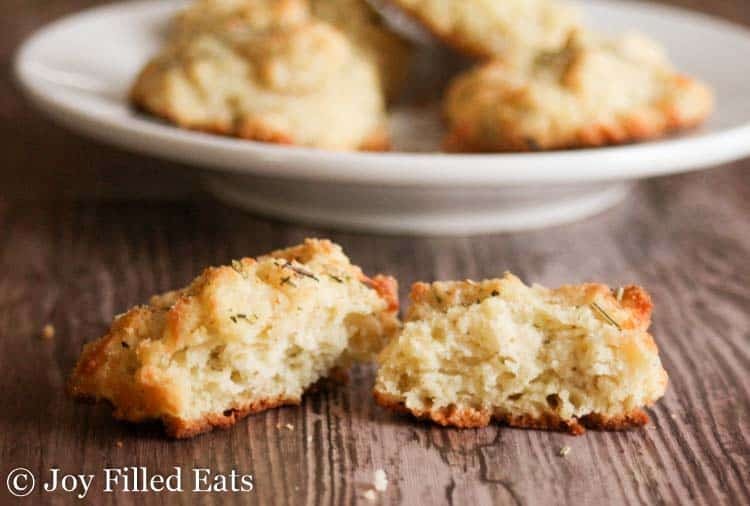 These Almond Flour Keto Biscuits mix up in just five minutes so they are easy enough for any day of the week. One of my closest friends, Marisa, and her husband got to go on a trip to Monte Carlo, Monaco a year or so ago and before I left I joked that she needed to bring me back a souvenir. She actually did and it was a little cloth sack of Herbes de Provence. It has a unique flavor compared to other herb blends. I really enjoy using it in savory baked goods, on chicken, and on roast vegetables. I use this biscuit batter as a topping for my Low Carb Chicken Pot Pie! If you love these make sure to give that a try as well. There is something amazing about a warm biscuit dripping with butter. They are great as a side dish, with soup, salad, or just as a snack. 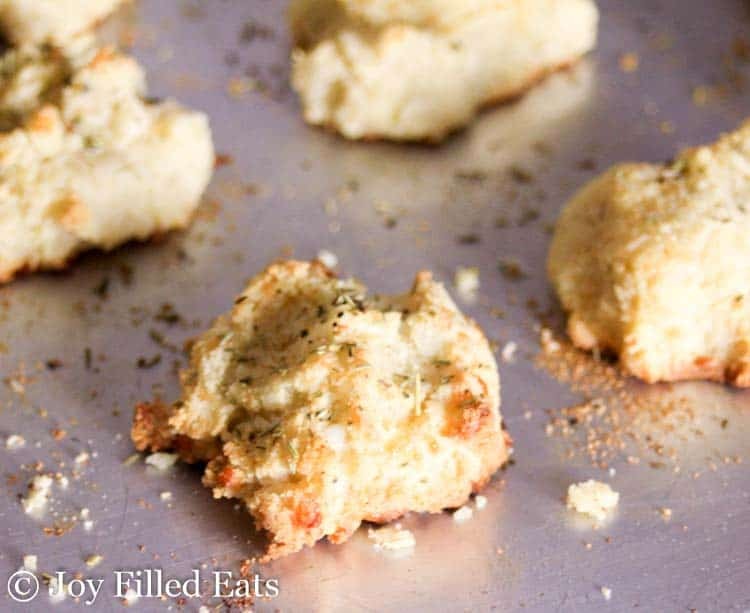 These Almond Flour Biscuits mix up in just five minutes so they are easy enough for any day of the week. Combine all the batter ingredients (except the mozzarella) and mix until smooth. Gently fold in the mozzarella. Put 12 blobs of dough on a baking sheet. Brush or spray with a little olive oil. Sprinkle on additional garlic powder and herbs. Originally published November 12, 2016. Revised and republished August 7, 2018. These are amazing. My husband said he would never know that they aren't real flour biscuits... SO delicious! There is a nutrition table below the recipe. 3 net carbs per biscuit. Low carb but I can still have my bread.....love. this. How would cream cheese be in this? I would think it may stiffen the dough, bit otherwise it should be OK. Also, my husband HATES coconut four, even the tiniest bit will ruin a recipe for him. I usually just sub the same amount of almond flour, do you have a better suggestion? Thanks! Cream cheese in addition to the other ingredients or as a substitution for the sour cream or mozzarella? You should be able to use all almond flour. If the dough seems too wet using 1:1 just add a little more. Sorry, I should have been more specific, I meant cream cheese instead of sour cream. I did have some sour cream and they were awesome!! Thanks! I made these tonight to go with soup. They are amazing. Thank you for sharing all your delicious recipes and your joy of cooking. I just mixed up the Almond Flour Biscuits. It's nothing like a "dough"; very dry and crumbly. Since I can't "Put 12 blobs of dough on a baking sheet" I'm going to try to save it and add 1 more egg, spread it over a cookie sheet and press it together enough to cut it into squares. I reviewed the recipe 5X and was really looking forward to those scrumptious looking biscuits in the photo. HELP! Hi Peggy, are you positive you only used one tablespoon of coconut flour? If that one measurement is off it can throw off the whole recipe. These have about .5 cup wet ingredients to 1.5 cups dry ingredients. That should be plenty to moisten the flours. I know I am going to love these! 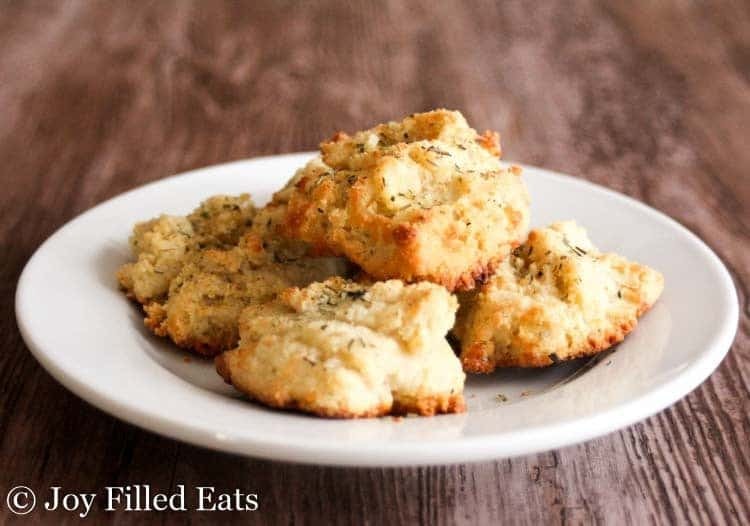 I would NEVER have thought keto biscuits would be possible! This recipe is great! I am desperately looking for bread and biscuits (really any baking recipes) in low carb that doesn't have any eggs in it. So far in reading about almond flour and coconut flour using eggs is a must. I used apple sauce or ground flax seed (water) as a egg substitute in the past for my baking and cooking but that is before I wanted to go low carb. Basically I need any kind of recipes that I can still do low carb but egg free. Is there any out there?? I have looked up vegan recipes but they are not low carb and/or use white flour. I need something in the middle lower carb and no egg and doesn't use expensive extra ingredients. 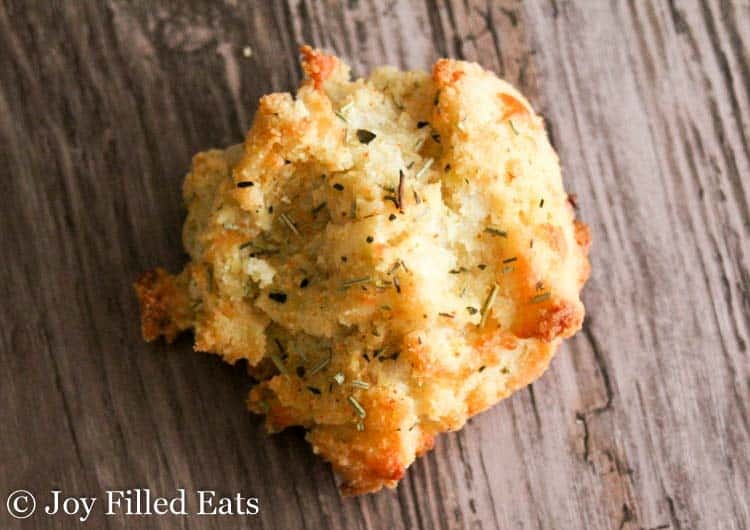 This is the best low-carb biscuit recipe ever! Trust me, I've made a lot. I used onion, chive and garlic for spices and it's just amazing. Great texture and flavor! So yummy!! So excited to have had this recipe, will use it many more times. So glad I could have this with my left over turkey broccoli cheddar Soup. Yum!! I'm glad you liked them! Turkey Broccoli Cheddar Soup sounds great!